He’s a United States Air Force Fighter Pilot. He’s not lazily sitting back with his aircraft on auto pilot. He’s been given a task. He’s fighting for yours’ and my, family. He knows he’s helping to stabilize the world. To his comrades, his arrival is Knightly. He’s carrying air to air-missiles. And ready for active combat. Doing cartwheels in the sky. He can flip, and nose dive. Boy, can that guy fly! He’s loaded and ready to aim fire. He quickly focuses in on his fast moving target. He sees the enemy aircraft spiraling down. He knows his mission has been accomplished. 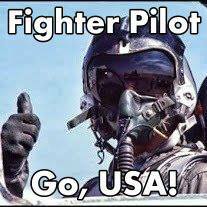 He’s the United States Air Force Fighter Pilot.